Posted in General Health on April 26, 2011. Last modified on January 31 2018. Read disclaimer. Q: I've always thought that high blood pressure was just one of the consequences of getting older. What causes it? While the cause for this condition can be pinpointed in some cases, the exact cause of this silent killer that affects more than 75 million Americans (nearly 1 out of 3 adults) remains a medical mystery. Research shows that calm, collected individuals are just as susceptible to hypertension as are highly active people. If one or both parents had it. Blacks are twice as likely to have it as Caucasian or Hispanic adults and tend to develop it at an earlier age. Obesity is also a major risk factor -- as is diabetes. Smoking significantly reduces the benefit of blood pressure lowering medications and is a risk factor for heart disease. Q: What, exactly, is blood pressure? Let's start with the basics. Each beat of the human heart -- 60 to 70 per minute -- pumps two to three ounces of blood into the large arteries leading to all of the body's organs. Between beats, the heart refills with blood. If there are no obstacles, blood will flow freely throughout the system. Blood pressure is the force exerted against the walls of the arteries that conduct the blood throughout the body. Studies have found that people who monitor their blood pressure at home - in addition to readings at the doctor's office -- are more likely to reach their blood pressure goals. Upper-arm monitors tend to be more reliable than wrist or finger monitors -- but make sure your cuff-style monitor is the correct size and is appropriately validated, since seniors, pregnant women and children. Since blood pressure monitors can be somewhat expensive, check to see if the cost would be covered by your health insurance. Don't smoke, drink coffee or alcohol, or exercise within 30 minutes of taking your reading. Check your blood pressure at the same time of the day. Blood pressure tends to be lower in the mornings and then rise throughout the day. Go to the bathroom (a full bladder can raise blood pressure readings 10-15 mmHG) and relax for a few minutes before taking your reading. Sit up straight with your back supported, feet flat on the floor, arm placed on a table or flat surface and cuff at the same level as your heart. Cuff should be snuggly wrapped on the upper arm on bare skin. Center of cuff should be positioned over your artery. Stay calm during reading and don't talk. Take two or three readings, one minute apart and record the results. For more tips, watch this video on how to monitor your blood pressure at home from the American Heart Assoc. 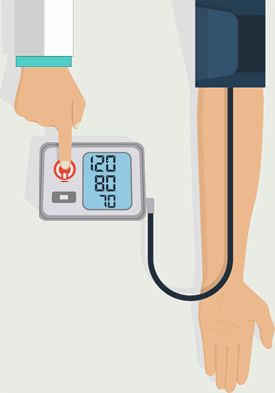 Q: When taking blood pressure readings, what do those numbers mean? In simple terms, blood pressure readings measure the force of the blood against arterial walls in two stages -- when the heart beats to pump blood out of the heart and when it relaxes to refill. The first is called systole, and the second is diastole. A reading of 120 over 80, for example, indicates a systole (beating) pressure of 120 and a (between beats or resting) diastolic pressure of 80. Anything under 120 over 80 is considered within the normal range. Q: How serious is hypertension? Can it be fatal? High blood pressure -- hypertension -- results when the blood encounters resistance in moving throughout the body, building up pressure against the walls of the vessels, which forces the heart to work harder. High blood pressure contributes directly or indirectly to about one million deaths each year and accounts for more doctor visits and prescriptions than any other medical problem. If left untreated, high blood pressure causes the walls of the small arteries to thicken (which reduces the flow), and weaken (which increases the chance of rupture). If this continues long enough, the result can be a heart attack, stroke, kidney, eye, or brain damage or other potentially life-threatening problems. Q: How do you know if you have high blood pressure? Unfortunately, in most cases, you don't. It is called the "silent killer" because it rarely causes any symptoms. That means that the disease can do virtually all its damage before it is detected. Hypertension is most often discovered during a routine physical exam or even by a screening at a health fair, for example. It takes more testing to confirm the diagnosis, however, and to determine the severity of the condition before appropriate remedies can be recommended. For a diagnosis of hypertension, the blood pressure readings must be consistently high on several different occasions. Q: If I have all the risk factors for high blood pressure, does that automatically mean that I will get it? No, although it certainly increases the odds. Fortunately, discovering that you have high blood pressure gives you the chance to add years on to your life. The good news is twofold: you may be able to prevent hypertension by making some lifestyle modifications, and, if you are diagnosed, most cases can be kept under control. Q: Are you saying it can actually be prevented? Get plenty of exercise at least three times a week. Watch your weight and get rid of those extra pounds sensibly. Eat plenty of fruits and vegetables to get lots of vitamin C and minerals like potassium and calcium. Some researchers suggest getting a dog, because having a pet is a calming influence. Strangely enough, study after study shows that petting or talking to your pet brings blood pressure down and keeps it down as long as the contact with the pet is maintained. Other non-pharmacologic stress-management tools include meditation, acupressure, biofeedback, music therapy and even, perhaps, eating certain foods such as garlic, onions and broccoli (though patients on the blood-thinning medicine warfarin may want to exercise caution with these). Recent studies have shown eating tomatoes to be especially beneficial to men, who face a slightly higher risk of high blood pressure than women. Tomatoes are high in vitamin C which can help lower blood pressure and the lycopene in tomatoes have been found to lower the risk of prostate cancer in men who eat tomatoes several times each week. That also goes for pizza, spaghetti sauce and even catsup! But try to minimize the salt -- since sodium can negate all their other benefits, and learn to read the labels on the foods you eat. Finally, lighten up a little and get in a good laugh several times a day. You'll be amazed at how much better overall you'll feel. Q: If lifestyle and diet modifications don't correct my high blood pressure, how else can you treat it? Over the past decade, there have been numerous advances in the development of antihypertensive medications. They have been shown to work best, however, when patients take them in concert with a healthy diet and plenty of exercise. The important thing to remember about blood pressure medication is that every case is unique and medications are not interchangeable. In reaching an appropriate prescription, we have to take into consideration drug interactions and the patient's overall health. The first line treatments include diuretics, which help the body get rid of excess fluids, and beta-blockers, which reduce the workload of the heart. Two newer types of drugs -- calcium channel blockers and ACE inhibitors -- have been found to be quite effective with fewer side effects. In many cases, it is appropriate to use ACE inhibitors -- designer molecules that attach to a target enzyme and prevent it from triggering a signal to release a blood pressure increasing hormone -- as the first line of treatment. Again, an appropriate treatment plan is based on test results and the patient's overall condition, and may involve a combination of medications. Control of high blood pressure with a minimum of side effects calls for close cooperation between patient and physician. The biggest obstacle to success is compliance -- many people simply don't take their medications as directed. If problems occur with one treatment option, there are other medications to try. The important thing is to arrive at an effective treatment plan and stick to it. If you fall in the high risk category for high blood pressure, or have had several high readings in recent months, make an appointment with your doctor as soon as possible. It is never too early to start on a hypertension prevention plan. Source: yourfamilyshealth.com: You Don't Have to be Tense About Hypertension.